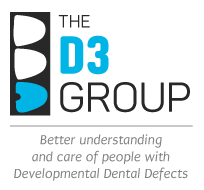 D3 Group - Developmental Dental Defects - - > What are D3s? > What are Chalky Teeth? > What is Molar Hypomin? > How Can Families Help? "D3" is just a simple way of saying "DDD" which in our case stands for "Developmental Dental Defect". As the long-winded name suggests, D3s originate from developmental problems – that is, things going awry when the tooth was being formed inside your child's jaw. So D3s can be viewed as a sort of congenital disorder or birth defect, as explained to 6-year-old Sam in our child-friendly storybook. here 'n' there" (with a hat tip to Ted Geisel). Nearly all D3s affect the outward appearance of the tooth enamel – sometimes just a small patch is affected (or "wonky" as your child might say) and other times it’s wonky all over. Such discolourations may not necessarily be of concern if the enamel surface remains sufficiently hard. However, when the patches of abnormal enamel are soft and porous ("chalky"), there is increased risk of toothache and tooth decay (i.e. 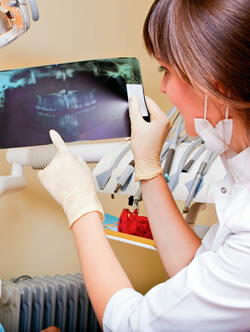 dental caries) – so dental treatments may be recommended to nip these problems in the bud (read more). There are four main types of D3 you may hear about, as summarised and cross-compared below. 1. "CHALKY MOLARS" / "MOLAR HYPOMIN"
Chalky molars are of particular concern to The D3 Group because they are the commonest type of chalky teeth and cause a lot of suffering and costs around the world. Technically, chalky molars are called "Molar Hypomineralisation", or "Molar Hypomin" for short ("hypomin" is pronounced "high-po-min"). You can learn many things about Molar Hypomin throughout this website but a good place to start is here. The picture shows a bad case of chalky molar in a 6-year-old. Fluorosis (or more properly "Dental Fluorosis") refers to the speckled white patches you often see on people's front teeth. Fortunately, most cases of fluorosis in our part of the world are mild and not of dental concern, particularly when the protective "anti-decay" benefits of fluoride are considered. However, as our picture shows, there is potential for worse types of fluorosis that exhibit pitted, discoloured enamel – these arise from excessive ingestion of fluoride when the teeth are developing. So that's why there are such strong guidelines about watching how much toothpaste your infants use. 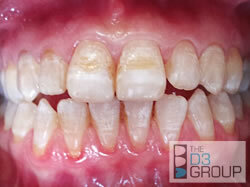 Learn more about dental fluorosis here. 3. "SURFACE PITS AND GROOVES"
AI is short for "Amelogenesis Imperfecta" (meaning imperfect enamel formation) and is the worst type of D3 because all teeth are affected usually – but fortunately for most of us, AI is quite rare. This is the only enamel defect that’s regarded as a genetic disorder so there will be a family history in most cases. And perhaps with AI it’s reasonable for kids to be kids and talk about "mutant teeth", in contrast to the other types of D3 including Molar Hypomin. There are many different types of AI, depending on which gene is affected. Learn more here and here. The picture shows a bad case of AI in which all the teeth are chalky and discoloured. As detailed here, Molar Hypomin comes out the overall winner as troublemaker when comparing the four major types of enamel defect. The figure and table below show that, whereas AI can be quite devastating for the families concerned, this genetic disorder is relatively rare and so poses a small burden for society. 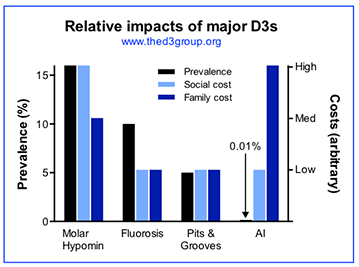 In contrast, Molar Hypomin is the commonest D3, the most costly to society, and often expensive for families (in terms of suffering, time and money). 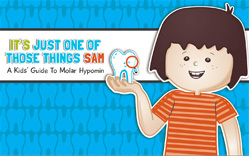 Molar Hypomin damages the 6-year molars of about 1-in-6 children worldwide, and about a quarter of these cases are severe enough to put the child at risk of major decay, extraction and orthodontic need. To make these comparisons, we have taken a typical version of each disorder as seen in the "new" adult teeth of healthy schoolchildren. Representative numbers are given for well-developed countries, including Australia and NZ, realising that significant differences exist in some other parts of the world. The family and social costs (right axis of graph) are arbitrary estimates only, taking into account prevalence, health risks and economic cost. High-impact features are shaded pink in the table. high levels of fluoride in drinking water and/or dietary habits. in paediatric healthcare an arbitrary value of 5% is used. don't last as long as usual. 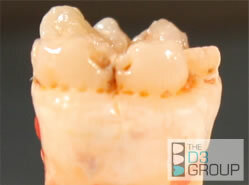 There are many other things that can go wrong during tooth development besides the four major enamel defects. 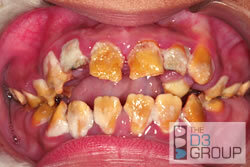 Some such dental malformations primarily involve enamel (e.g. ectopic enamel, enamel pearl) or dentine (e.g. dentinogenesis imperfecta, dentine dysplasia), or both (tetracycline staining), whereas others affect the number of teeth (e.g. anodontia, hypodontia, hyperdontia) or their size and shape (e.g. microdontia, macrodontia, taurodontism, tooth fusion, gemination, dens evanginatus, supernumerary roots). Yet other dental malformations appear together with other abnormalities as part of developmental syndromes (e.g. ectodermal dysplasia, tricho-dento-osseous syndrome, solitary median maxillary central incisor, Costello syndrome). All of these conditions are important (particularly to those suffering them!) and we hope that, in time, The D3 Group will be able to give them due attention.